THIS LOVELY DRESS HAS AN ELASTICATED WAIST AND RUFFLE V NECK WITH TINY BEADING TRIMS. Bead Trims & Short Sleeves. KINDEST REGARDS, PATRICIA. HIT THE 'BUY IT NOW' BUTTON TO ENSURE YOU'RE THE ONE TO GET ONE! Per Una M&S Maxi Dress size 16 M. Grey and Purple Stretch Fabric. Slip Over Style. Machine Washable. Pit to Pit.21”. Length. 54”. Per Una Dress, Size 10, Marks And Spencer, Brand New, Non Iron Quick Dry. Condition is New with tags. Dispatched with Royal Mail 1st Class. 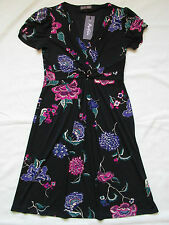 IVORY BLACK FLORAL LADIES CASUAL PARTY A-LINE DRESS SIZE 14 R PER UNA V-NECK, side zip, fully lined. This can be affected by different light conditions or your screen settings, depending on your local screen settings photos might appear differently as brightness and colour settings can affect their look. A lovely fit & flare dress by Per Una in size 12 L. Pull on dress. Tie to back of dress. A chiffon over a navy blue layer. has a thin tie back at the waist, but if you didn't like this it could easily be removed. Pit to pit 18". Midi length, V neck, short sleeved, bright floral print in red's green and navy blue. 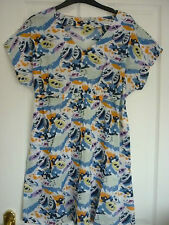 M&S Per Una UK size 16 Floral jersey dress. Length 44" Bust 38" Waist 36". Full labels to interior. STRETCH FABRIC. New multi dress from per una m & s.
Per Una Size 8 Brown and White Summer Dress. Per Una Size 8 Brown and White Summer Dress.. fabulous for a summer evening. Condition is Used but rarely worn. Tie belt, fully lined. Dispatched with Royal Mail 2nd Class. Blue lagoon crinkle style V neck midi dress from Per Una. A stunning dress in gorgeous mixed blue tones - easy to dress up or down - Perfect. Side zip fastening. Chest (Pit - Pit) 19" / 48cm. STUNNING DRESS. THE VERSATILE DRESS THAT COULD BE WORN FOR ANY OCCASION. LENGTH 53"-54". 95% VISCOSE 5% ELASTNE. PER UNA DRESS. TURQUOISE LINED. BLUE RED WHITE BLACK PRINT. WRAP TOP STYLE. Dress Length: 38". Pit to Pit: 18". Per Una Dress. Armpit to Armpit : 19". FOR SALE PREVIOUSLY WORN IN VERY GOOD CONDITION NAVY BLUE WHITE LADIES CASUAL LONG DRESS V-NECK PER UNA SIZE 12 FLORAL, CRINKLED, FULLY LINED. This can be affected by different light conditions or your screen settings, depending on your local screen settings photos might appear differently as brightness and colour settings can affect their look. Sheer Material - Beach Cover Up. PER UNA 12 NAVY BLUE "LACE" OVERLAY V NECK CAP SLEEVE DRESS WORN ONCE! THE DRESS BY "PER UNA" IS IN VERY GOOD CONDITION WORN ONCE ONLY! NAVY BLUE IN COLOUR 95% POLYAMIDE 5% ELASTANE STRETCHY "LACE" APPEARANCE MATERIAL LINED IN NAVY BLUE POLYESTER. FRONT V NECK, CAP SLEEVES, TWO TIERS NEAR HEM, FIT AND FLARE SHAPE. Blue Mix Short Sleeve Wrap Drape Calf Length Jersey Dress. PER UNA by M&S. - The dress is a pull on style. - Shoulder (seam) down to the hem 44,5". - Armpit down to the hem 35". back nape down to the hem 41,5". Marks & Spencer Per Una Size 16, long. Fully lined casual summer dress. Please see other items. Crinkle chiffon material. An off white ( slightly grey ) coloured dress with a black and taupe floral print. Side ties that tie towards back. Concealed side zip. LADIES FULL LENGTH M&S PER UNA DRESS. BLUE & WHITE COLOURS. LENGTH MID BACK NECK TO HEM IS APPROX 51". IN VERY GOOD CONDITION. Beautiful, light and breathable wrap dress by Per Una. Jersey material. Flattering fit. In good, clean, wearable condition. Per Una pretty dress size on tag uk 12R approx bust 34 inch bust. And also take note australia. Pretty purple and white flower dress by Per Una M&S. Dress has contrasting fabric patterns and inlay ay back of neck. No material label but soft stretch fabric, elastane blend. LIVE TOO FAR AWAY?. HAVE A CLEAR OUT AND MAKE MONEY. WHAT’S YOUR ALTERNATIVE?. • Ladies & Gents clothes & boxed shoes. Alex SPENCER clothes agency. WE HAVE FACILITIES FOR COLLECTION. United Kingdom. Per Una Navy Mix Dress - Size 12 - BNWOT. V-neck dress which is ruched just under the bust, elasticated waist and slightly longer length sleeves. Dress just pulls on over the head. Navy blue floral patterned shift jacquard dress with a textured finish. Tapestry-style floral patterning in shades of pink, cream and blue. Lined in blue except for the sleeves which are unlined. 6" centre back split. LADIES LONG DRESS - BLUE MIX PATTERN IN SHEER MATERIAL - FULLY LINED WITH A DETACHABLE STRAPPY DRESS - V NECKLINE - FLARED WITH UNEVEN HEMLINE - TIE BELT - SIZE 8 LENGTH 47 FROM SHOULDER TO LONGEST HEMLINE BUST APPX 38 VERY GOOD CONDITION PER UNA . White with a navy floral pattern, it has a v neck with a navy and white trim. It has a navy waistband. It is calf length, has cap sleeves and is fully lined (other than the sleeves). At the bottom is three little layers of the different materials, white, navy and navy and white. Make Marks And Spencer per una. chiffon type material. USA SIZES ARE 2 SIZES SMALLER THAN UK,EG SIZE UK 12.USA 8. MAKES DO DIFFER IN SIZES SO MAKE SURE BY ASKING.